Residents describe them as "bright, red, moving swiftly and silently" as unidentified flying objects were reported sighted over Sioux City Tuesday night. A flurry of reports started about 8:30 p.m. and continued until 10:45 p.,m., filtering into local authorities, the U.S. Weather Bureau, the Sioux City Air Base and The Journal. Sightings were reported in Riverside, Morningside and mid-city. Reports of UFO sightings have come in increasing numbers recently in the upper Midwest, including by highway patrolmen and weathermen. 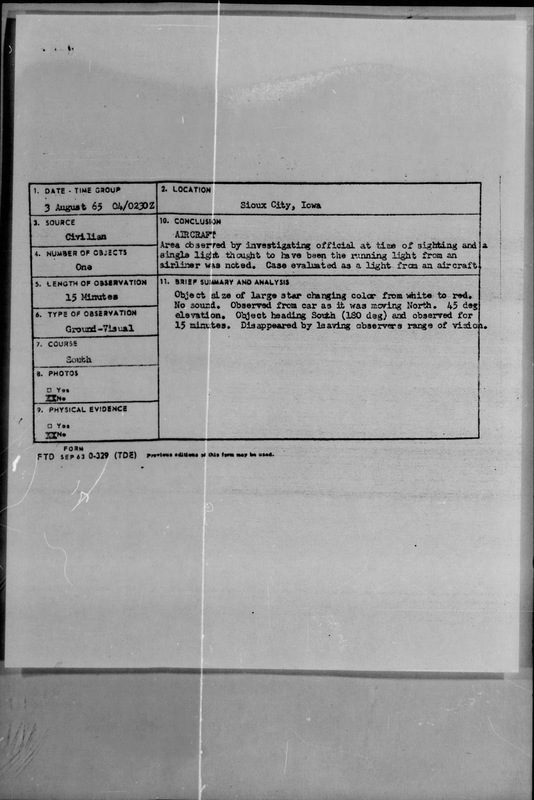 But could this document prove it was just a plane?